Marjorie came to Canada with her family at aged 11 from Essex, England, first settling in Edmonton. They relocated to Chilliwack where she went to high school. A UBC graduate, Marjorie is a retired librarian. She recalls her mother and grandmother teaching her to knit when she was about 5. She took a pretty long break and didn’t pick up the needles again until she had her children. She says it was kind of like riding a bike…her fingers remembered how to do it! “I love to do some form of exercise every day” she says and that includes walks around her West End neighbourhood, cycling, swimming and Tuesday golf. Marjorie and her hubby are enthusiastic travelers, having spent time recently in Haida Gwaii, the UK, and visiting family in Ontario. She is also the coordinator of a knitting group at her church, knitting dolls, shawls, and blankets & baby hats for various charities. She took up the flute in retirement and now plays in a community band. This is one busy lady! When asked where she gets her knitting patterns and ideas, she’s quick to credit friend and fellow WCKGer Margaret! She describes her Ravelry use as “intentional”. The most fun she’s had knitting was her knit Fussy Cuts Blanket by Kay Gardiner & Ann Shayne, which one of her friends had made and she “just had to make one”. She is always delighted when one of her grandchildren asks her to knit them something and is particularly proud of an Aran sweater she knit for her son many years ago. What’s not finished in Marjorie’s knitting basket? A green cotton sweater that took about 3 years to complete and has been waiting for about 10 years to get sewn together. Why? “It just doesn’t look right”. We can all sympathize! “I love autumn colours”. Green, orange, yellow are her favourites and loves to have real honest to goodness 100% wool on her needles! When asked what her fantasy project would be, Marjorie couldn’t think of anything that she’s longing to knit! Perhaps, she’s already made it…see “Fussy Cuts Blanket” above! 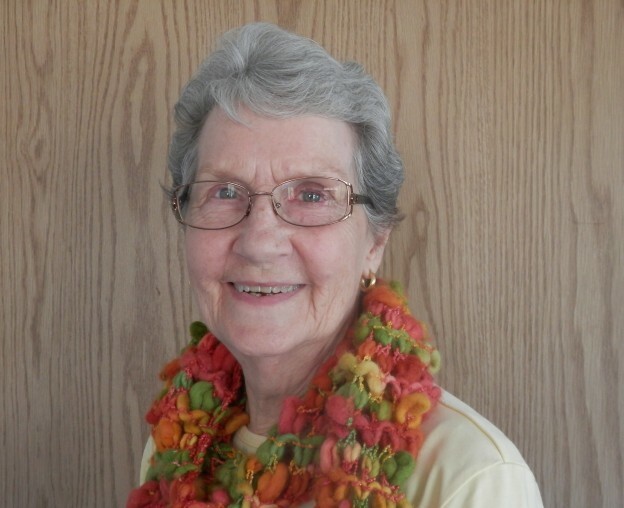 A Guild member since 2003, Marjorie was encouraged to join when she met two other members and she’s so glad she did! She loves show & share and the company of other knitting addicts makes the Guild meetings a fun evening. “Always do a gauge swatch” and “keep a journal of all your work…with pictures”. This entry was posted in member profile on April 25, 2016 by Debbie T.